AP reports the Acela Express train from Boston to Washington, D.C., will soon be wrapped end to end in an outdoor advertisement for the History Channel’s “1968 with Tom Brokaw.” The train will resemble one of those inner city buses, with 3M-inspired wrapping showing Bob Dylan, Richard Nixon, Robert F. Kennedy, and other icons of the late 1960s. Target is spot on, with affluent business travelers boarding on platforms to pitch consulting deals with the government. Now, of course some will cry foul — why is a quasi-government-funded agency like Amtrak doing taking ad dollars? We remind those critics that this is competition, and even quasi-government agencies such as Amtrak and USPS need to raise cash to compete. 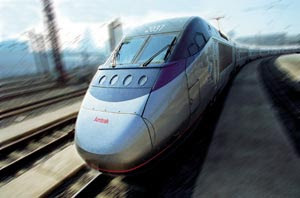 Heck, maybe now they can repair those warped tracks on the Vermonter line. So get aboard, check out the graphics, and chalk one up for Amtrak for having the guts to make money outdoor. Brokaw airs Dec. 9. Friday night, Amtrak back from D.C., we’re in the café car, and this bald guy in a blue jacket in front of us orders a drink. There’s something about the way he orders that gets attention. He makes a joke about a glass with ice, his smile twists into a dimple, and a blonde woman next to him starts blushing furiously. 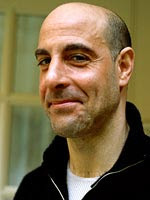 We think — hey, that’s Stanley Tucci. For those who know, Tucci is an actor with serious chops, going the distance with Meryl Streep, Tom Hanks, and Peter Jackson. But for marketers, the interesting thing about the exchange was what happened later. Tucci on the train created a viral marketing case study. We go back to our seat, and for about 60 minutes no one says anything. And then, strangers start chatting. Did you hear there’s a movie star on the train? I can’t remember that guy’s name, but I love him. Wasn’t he in that film Devil Wears Prada? I think he’s filming in Philadelphia with Peter Jackson. Somehow, the ideavirus of Stanley Tucci slowly spread across the train, until it reached a subtle tipping point and everyone knew. Stanley got off in Stamford, and people kept chatting. One woman who shook his hand kept recounting the story. And then the news slowly died off … like the exponential and then diminishing curve of a viral infection. Sure hope that guy wasn’t carrying anything serious.